I’ve been really busy working with the Players Focus Group (PFG) to balance the upcoming release of Lands Lost Expansion so please forgive me that it has been a while since my last deck post. Bloodpack Shaman – Ability changed to “When Bloodpack Shaman is summoned, target Wulven ally in your graveyard except Bloodpack Shaman is returned to your hand.” (from “When Bloodpack Shaman is summoned while every ally in your graveyard is a Wulven ally, target Wulven ally in your graveyard with cost 3 or less is returned to your hand.”). This particular change was interesting to me as I quite enjoy playing with Bloodfang but have really had zero success with the “OP Shaman Looping”. The Shaman rejig fits my playstyle quite a bit more so I decide testing was going to be quite enjoyable and it is. 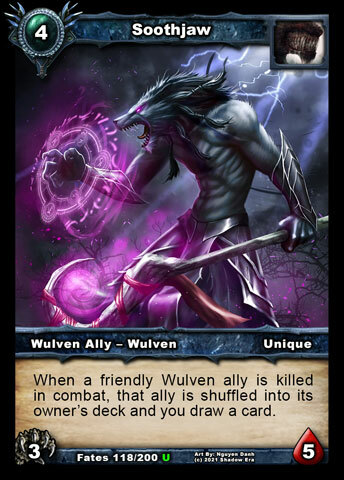 Wulven have a general theme of pack mentality leaning on each other to create a unified strength. The goal of this deck is to establish Meat Wagon and Howlfang for the attack boost supported with a swarm of the pack. The star of this build is Dread Wolf. Once you are setup properly you gain big growing damage allies at an affordable cost. Dread Wolf is generally not the most threatening ally on the board first so you have an opportunity to get some shots in with him and grow that attack. Everything else really is in support of maximizing his potential. I don’t mind killing Dread Wolf off because I plan on recycling them as well. Howlfang is the Wulven version of Aldon and he shines. He’s an immediate threat that must be dealt with and really creates a nice tempo swing with his free summoning effect. Generally your go to tempo guy is Dread Wolf who will come in swinging for 2 attack. He can hit for 3 if you have Meat Wagon in play and ally on top of your deck. Bloodpack Shaman and Wulven Rally are here to be Wulven recyclers. 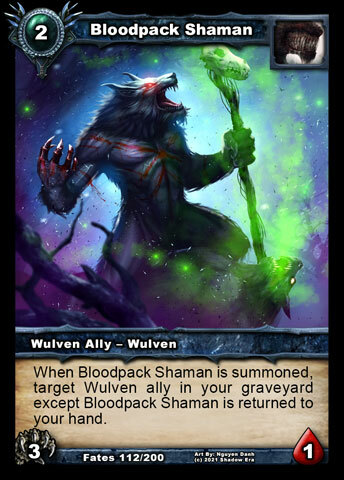 Mostly I want to use Bloodpack Shaman to recycle Dread Wolf, however retrieving a key ally from the graveyard at critical times can be game changing, such as killing off an about-to-die Griptooth to retrieve and re-summon with full health. 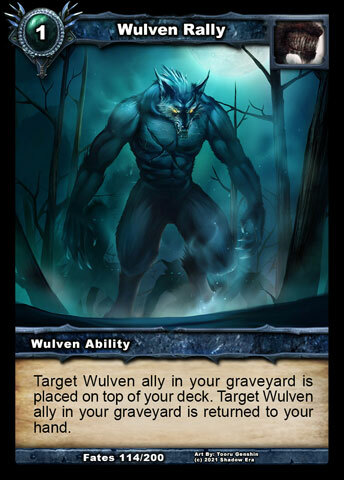 Wulven Rally is interesting because it can help stack the top of your deck to make sure you are getting your Meat Wagon bonus, also it is a cheaper way to get a Dread Wolf in hand and Bloodpack Shaman in reserve (top of deck next draw) to keep the recycling of graveyard allies going. Wulven Scout is here to help you plan your moves in advance. Knowing what your opponent currently has can help give you a turn of setup. Also has aggressive stats which I like. 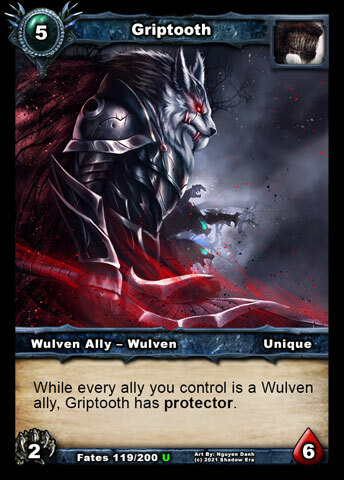 Wulven Predator is here is assist with opposing protector and stealth. He also has aggressive stats so helps fill gaps when maybe Scout is not available. Soothjaw is an interesting ally. Not sure if I like him or hate him but he has some synergies with the build. I like recycling allies but this guy actually shuffle cards back to the deck. Generally early you want allies in the graveyard and not recycled to the deck, so he becomes a later-play ally for me. Really the preferred card to shuffle back to the deck is Bloodpack Shaman. Situations may arise where you might need the draw so playing him and sacrifice an ally to combat retaliation damage must be done. He might be a candidate for replacement but needs more testing. Griptooth can be a game-changer. Aside from having amazing artwork, his greatest asset is protecting your other allies to execute your game plan, like Howlfang, hasted Dread Wolf and/or swarms of allies. Riphide really is a just-in-case ally for this build, but he comes in strong and puts a large body on the board. Riphide can get a fairly large swing when combined with Howlfang, Meat Wagon and/or Bloodfang’s ability. He is in the category of support to go along with Now You’re Mine and Death From Above to give varied removal cards to the deck. 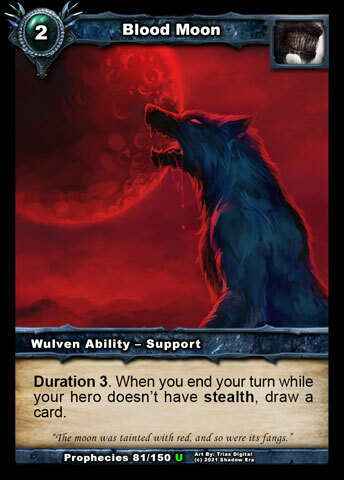 Bloodmoon is the main draw of the deck but is supported by various other draw types needed to keep up with the tempo boost of Bloodfang and Howfang’s summoning swings. 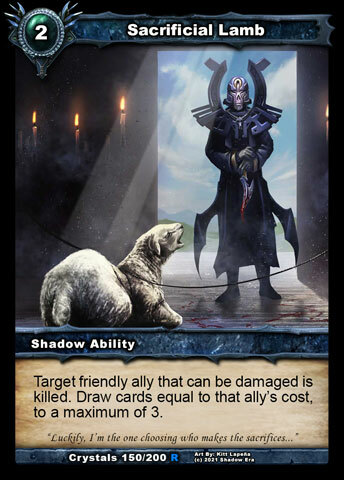 Sacrificial Lamb is a must and can be used early when needed but is mostly packed because of the amount of Unique allies the deck has. I do not mind using on turn 4 with 2cc removal/Shaman because you want to make sure when Bloodfang’s ability is ready you are able to full advantage. Be sure to let us know how you get on with the deck or what changes you make. See you again next time (said Bloodpack Shaman). Tagged bloodfang, Shadow era, shattered fates, wulven. I like so much this deck, but against damned weapon of hunter’s and assassin’s? Well remember you can’t win against everything. You could try subbing out Southjaw and replacing with Tiger Wulf.